With a stay at Hotel Danaos in Chania (Nea Chora), you'll be within a 10-minute drive of Chania Lighthouse and Venetian Port. Featured amenities include express check-in, express check-out, and dry cleaning/laundry services. A roundtrip airport shuttle is provided for a surcharge (available 24 hours), and free self parking is available onsite. With a stay at Corfu Boutique Apartments in Corfu, you'll be on the beach and minutes from Agios Stefanos Beach, and close to Arillas Beach. Free self parking is available onsite. With a stay at Kouneni Apartments in Mykonos, you'll be within a 5-minute walk of Windmills of Mykonos and Panagia Paraportiani. The front desk is staffed during limited hours. When you a stay at Belair in Santorini, you'll be near the beach, just steps from Museum of Minerals and Fossils and Perissa Beach. Featured amenities include a 24-hour front desk and luggage storage. When you stay at Villas Kalives in Apokoronas, you'll be 14 minutes by car from Port of Souda. Free self parking is available onsite. 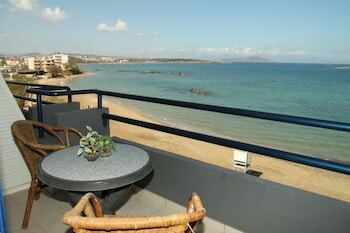 With a stay at Evagellina in Rethymnon, you'll be near the beach, within a 10-minute drive of Fortezza Castle and Town Beach. The front desk is staffed during limited hours.